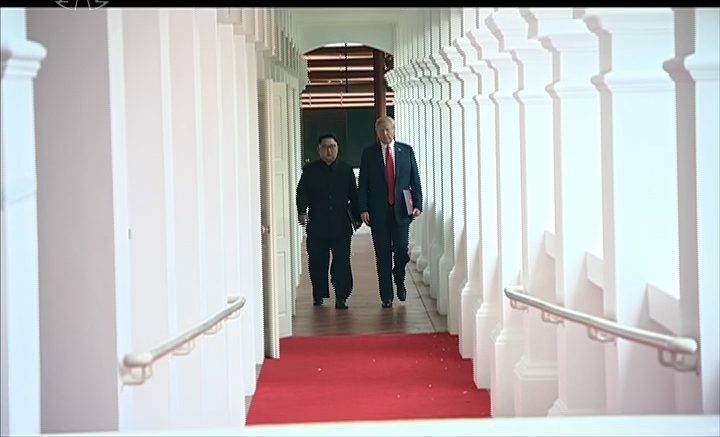 As expected, Korea Central Television broadcast a documentary on Thursday about Kim Jong Un’s trip to Singapore and his meeting with Donald Trump. The documentary was about 45 minutes long and gave most of North Korea its first look on video at Donald Trump. As with all state TV coverage, the documentary wasn’t focused on the summit but focused instead on Kim Jong Un. So it followed his trip in chronological order, starting with his departure from Pyongyang Airport. The summit came later in the program. It was first broadcast at 15:09; 17:00; 20:00 and 22:00. 2 Comments on "How North Korean TV covered the summit – Thursday"
You mentioned earlier in the week that they’d make the Thursday broadcast with this if they put a rush on. What’s the usual turnaround for a Kim Jong Un-related news event to show up on North Korean TV? In the last few years, we’d have seen something like this turning up 2-3 days after the trip ends but it seems they are getting faster. That could be down to newer editing technology but also a change in the speed at which information is broadcast, perhaps because of people listening to foreign radio broadcasts.